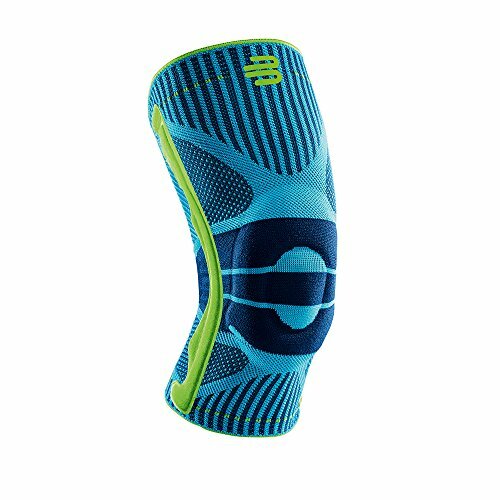 The Best Knee Sleeves provide protection for injured knees and prevent future injuries from sports and althletic events, running, walking, arthritis, or a day at the mall. Athlete or not, your knees deserve the best support, compression, and warmth from top-quality knee sleeves. Because we all have knees, you don’t need to be an athlete to be concerned about the health of your knees. Osteoarthritis of the knees affects millions of people all over the world, both young and old. So whether you’re engaged in a competitive sport, running or walking for exercise, need more stability on a trip to the mall, you’re overweight, or recuperating from an injury: compression knee sleeves can save the day. Take a look at our top choices and best knee sleeves we’ve listed below. We’ve detailed the Pros and Cons of each along with a description and summary to help you make your best decision. This pair of compression sleeves from Nordic Lifting is one of the brand’s premium accessories and are recommended for weightlifting, powerlifting, and Crossfit workouts. These sleeves are meticulously designed to prevent painful injury and to increase your performance with the following great features. Help increase your performance and help you complete physical routines at the top of your ability. Add support to your body’s weaker joints (knees), so that you can avoid having injuries and unnecessary pain. Great compression helps relieve joint and muscle pains and helps aid in muscle recovery and rehabilitation. Well known for their warming effect, which efficiently reduces stiff muscles and joints. By retaining heat, the risk of having injuries is also reduced. Price includes one pair with one year replacement guarantee. • Nordic Lifting’s sleeves are designed for people who are into weightlifting, powerlifting, Crossfit, and gym exercises, as well as other heavy fitness workouts. • Nordic can help you perform at your best by providing the support that you need and compression for speedy muscle recovery and injury prevention. Rehband 7051 is definitely one of the most popular options, especially for Crossfitters, even though they are on the higher end of the market. This Rehband knee sleeve is sold per piece and endorsed by popular names in Crossfit. There’s no doubt that this knee sleeve is top shelf when it comes to performance and quality. It is made of 100% neoprene with the top layer made with strong and durable material pique, adding even more support. It has dimensions of 11 x 7 inches, and weighs only 4 ounces. It has an anatomical shape and a two panel 3D design which provides a high level of comfort. It uses an advanced material technology for enhanced durability. It is used and popularized by fitness athletes, including weightlifters all over the world. It provides warmth, powerful stabilization, and strong compression to the knee joint to support blood flow and reduce swelling if there is any. It relieves pressure and improves coordination. It can help prevent knee strains and injuries. It also has a recovery effect which can help the wearer recover faster and rehabilitate faster from existing injuries. It has sizing guidelines to ensure that you will find the correct fit for your knees. It is sold as a single sleeve and not as a pair. • If you’re serious about your knees, workouts, and crossfit exercise, Rehband is the one. 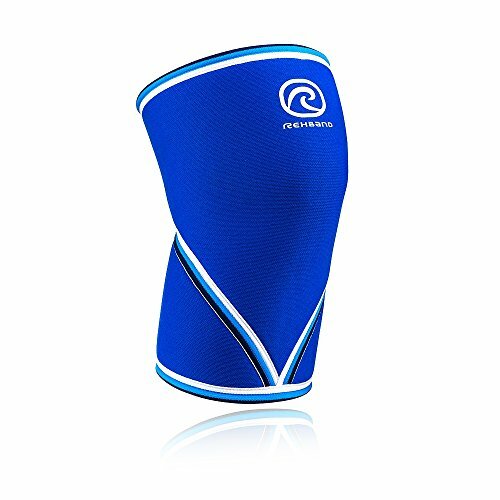 • If you are looking for a company that really takes pride in producing durable, long lasting, high performance knee sleeves — then the original Rehband 7mm Knee Sleeve Model 7051 is for you. • Rehband comes packed with great features — which is why it is the top choice of many professional athletes, including weightlifters. 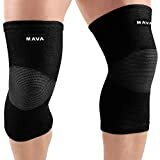 Mava Sports came up with these knee compression sleeves by thinking about people who need a product that can provide better knee support and compression. These sleeves also provide safety and injury prevention for those who are into cross training, powerlifting, weightlifting, and other heavy workouts. Mava knee sleeves provide orthopedic support to prevent any injuries as well as joint pain recovery, which is useful during rehab. Mava compression helps reduce inflammation and swelling by stimulating blood flow. They also help relieve muscle stiffness, soreness, pain, and knee discomfort, including arthritis, osteoporosis, and tendonitis. Heating effect and compression promotes pain relief from osteoporosis, and swelling and promotes muscular recovery and rehabilitation. No stiffness, no itching and never conflicts with full knee mobility. They are double-stitched for durability and built to last. Very comfortable and efficient for weight lifting, running, working out in the gym, or a trip to the mall. They come in different sizes, from small to double extra large. These 7mm knee compression sleeves by Mava Sports are guaranteed to help athletes and fitness enthusiasts with muscle recovery and prevent injuries. They are not limited to those who are constantly doing heavy workouts because they can also help those with knee problems and those who need knee support and compression. Mava Sports Knee Sleeves are anatomically shaped for better performance and for optimal support. They will also not slip off while worn. Bear KompleX is well known around the world for lifting gear such as belts, bands, hand grips and everything targeted towards functional fitness athletes. Reading the features below will show you why they have such a powerful reputation when it comes to strength and powerlifting sports. Both 5mm and 7mm — whichever suits you best, for optimal support and comfort. Provide good range of support and compression, especially when performing a variety of exercises like squats, power cleans, snatches, box jumps, lunges, running, double unders, and more. Aide in reducing pain by increasing blood flow during and after training and matches. Excellent warmth to help prevent injuries while performing different movements. Available in multiple colors that appeal to both men and women. Available colors are black, purple, red, black camo, blue camo, pink camo, neon yellow camo, stars and stripes, lightning, and Aztec, which is reversible with gray. Bear KompleX allows a full range of motion movements and offers good support and compression. Stoic’s Performance 7mm are the result of several years of research and development directed specifically at coming up with high quality and powerful knee sleeves. That is why, with years in the making, users can be assured that special attention was given to every detail of these sleeves and that there are no weak links in their construction. You will immediately feel the quality difference upon using the sleeves because of the great features, such as these listed below. Manufactured from highest grade and heaviest duty materials, so they are built to outlast other brands in the market. Ultra high density 7mm neoprene, which gives maximum support and rebound, especially when performing heavy workouts. Provide added heat retention, which can significantly reduce aches and pains during and after exercise. Superior levels of support and were tested to perform well even in the most extreme conditions. Stoic’s patent pending triple reinforced seam are considered to be the strongest stitch used on any knee sleeve. Designed and built to last — as the inside and outside of the sleeves are made with heavy grade tear resistant materials. Complete knee and upper and lower leg coverage and support as they come in full 30cm length. Added warmth and compression on the knee joints and other surrounding muscles. These performance 7mm compression sleeves from Stoic are indeed of professional quality, ultra heavy duty, and are built to last. Designed to be used for powerlifting, bodybuilding, and weightlifting, to achieve the next level in leg training. Provide maximum support and performance, which is why a lot of athletes and fitness enthusiasts prefer them. Challenge your best performances with these Stoic knee sleeves for powerlifting. Bauerfeinds aren’t your normal neoprene knee sleeves that most people are using in the gym. Bauerfeind GenuTrains are soft knit fabric that feels stretchy, comfortable, and is quite breathable. Where neoprene sleeves keep your knees and legs wet with sweat, Bauerfeind is manufactured to wick away moisture as it warms your knee cap area. Applications: built for sporting activities such as basketball, football, soccer, baseball, running, lacrosse, tennis, weight training & more! If you’re looking for a great all around knee sleeve that’s easily worn all day for comfort, support, and knee pain relief — look no further. The Bauerfeind Air Knit fabric is one of the most comfortable knee sleeves made with superior freedom of movement. They are really great for activities like basketball, baseball, running, walking, tennis, football, and all other sports that require a lot of freedom of movement. Telaleo Knee Sleeves are 7mm neoprene knee braces for powerful support and stabilization. Telaleos are used primarily for heavy lifting and deadlifts. However they are also advertised and used extensively for soccer, football, basketball, and so on. You’ll find them to offer great support and help with healing. High compression, stability, support, warmth, and at a great price make them a good choice for many. Telaleo Knee Sleeves come with mixed reviews. However, you will see for yourself that most negative reviews are due to people ordering too small. Take your time, order according to their chart, and you will have a great pair of neoprene knee sleeves for a very affordable price. UFlex Knee Sleeves come with great compression designed to improve endurance and keep your knees protected from injury. UFlex supplies moderate support and is great for arthritis, tendonitis, meniscus tears, and runners knees. They’re made from a nylon and Lycra blend for comfort, flexibility, and durability. Compression level is good for squats, weightlifting, yoga, etc. UFlex knee compression sleeves are absolutely great for running and walking. If fact if you’ve tried other brands and been less than satisfied, UFlex is going to amaze you. These sleeves use 3D technology to produce knee sleeves with a 4 way stretch. This 4 way stretch ensures you great protection, compression, warmth, and support. You will notice right away the heating effect that is helping to eliminate any swelling, stiffness, and sore knees. If you’re running with arthritis or sore knees UFlex Knee Compression Sleeves are going to provide unequaled pain relief and recovery time. Never worry about them slipping and bunching up, or rolling due to the double silicone anti slip wave that grips your leg and knee to keep you from constantly readjusting. When it comes to choosing the best knee sleeves, it is important to not scrimp on the price in order to get the best there is in the market. Each manufacturer designs in their own advantages and disadvantages, but the ones I’ve listed are some of the best that you can get. Just keep in mind that although there are different models of knee sleeves in the market and choosing the perfect one for your needs should not be too complicated. Always consider your needs, based on what you do and the workout routine that you have. Will you be doing a lot of heavy lifting? Are you a runner, or a jogger? Do you need knee sleeves to stay in place and comfortable all day for an injury? Looking for support and compression for arthretic knees? 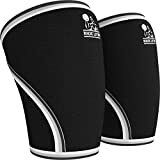 Some knee sleeves are best for one activity only, like sleeves for weight lifting; others are much lighter and more flexible to cover more activities with one sleeve. So it’s important to determine how much stability you need, and what you’ll expect to get the best results from your own knee sleeves. Great article on knee straps and equipment. Though I don’t have injuries at the moment, this can come in handy whenever a situation were to ever arise in my life or anyone else’s. The Rehband Knee Sleeve seemed to be a great option, especially since I go to the gym and do some heavy work here and there. I’m glad to stumble across this article, and you’re recommending great products for each and every type of athlete, runner or person out there. To tell you the truth, I sure wish I would have started using knee sleeves BEFORE I had any knee problems or injuries. That’s because knees are one of the most vulnerable joints in any sports activities or heavy lifting in or out of the gym. Sleeves do a great job of keeping your knees stable and inline when you’re putting any excess pressure on them from lifting or turning and twisting movements. Yep, if you’re knees are hurting when you’re running it’s best to give knee sleeves a shot. Knee sleeves can do wonders for helping your knee joints recover from a run and prevent injury. These all look like great options for knee sleeves. I don’t quite understand though how they help prevent injury. Is it because they give your knees extra support? Kind of like a belly band does for a postpartum mother? Would you recommend wearing these anytime you participate or engage in any physical activities/sports? Knee sleeves can definitely help prevent knee injuryies during sports activities. Knees are quite vulnerable to injury from the extra exertion placed on them, especially from the constant twisting and turning. The best knee sleeves will help keep your knee in line with your upper and lower leg during these movements. There are several other advantages to wearing knee sleeves that come into play both before and after physical activities. Not only do they help prevernt and heal knee injuries from the warmth and increased blood flow when we think of sports, but they do the same thing for arthritic knees even on a trip to the mall. I’ve had three operations on my right knee over the years, and while it’s “not bad”. having extra support when I’m doing exercise of playing sport certainly helps. There’s also a little bit of arthritis in my knee. For my particular issue the Mava Sports Knee Sleeves have got my attention. They sound like an upgrade from the compression bandage I sometimes use. I think I’ll take a look at these. Thanks for the tips. Thanks for reading and leaving your comment. And yes I definitely think using the Mava knee sleeve would be an upgrade from a bandage wrap. I would highly recommend trying a knee sleeve. At worst it wouldn’t help, and at best you would, like myself, be quite suprised at the added support and decreased pain both during and after physical activity. I have never considered knee support in any of my athletic endeavors so thank you for making me aware. I do a particular kind of exercise now where I walk up and down very steep hills holding weights. It is quite a workout. What I have noticed is that when going down hill I seem to be somewhat unsteady on my feet. Would some kind of knee support help me? Also, can these products help keep my legs from cramping after a workout? One final question. How long will these products keep their integrity without wearing out? Thank you so much for this useful info and I hope to hear from you! You should definitely try knee sleeves. What you describe is one of the best things knee sleeves do…..add support to the joint that makes you much more steady on your feet. As for cramping afterwards: there are so many things that causes cramps, that I couldn’t say. But there is a good chance that the added support and added blood flow from knee sleeves will help with that problem. When it comes to how long they last, I often hear of Rebands lasting years, while lesser quality knee sleeves lasting months. If I were you, I would definitely chose a quality knee sleeve and give it a shot.